On the guitar, like the A form, the E form is a standard barre chord shape. You use it to form major chords for notes along the 6th string, as shown here. You can form it into some unique chord voicings, especially when you use the extra note found in its arpeggio pattern. Here, you add only one note to the E form shape to complete the arpeggio pattern: a 3rd interval on the 5th string. Play it as a scale. 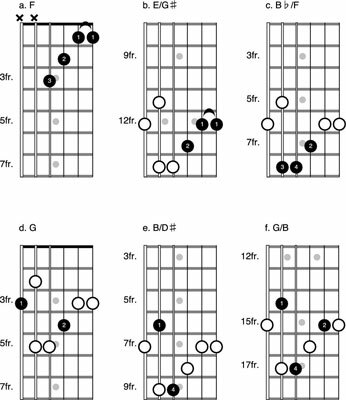 Here, you play some of the E form chord voicings heard in popular music. A is a common F chord that guitarists usually learn together with basic open chords. You can always play a full E form barre chord partially like this, and you can still visually track the root on the 6th string when you do. B is similar to the preceding F shape, but it’s reduced even further to include only the first three strings. This E/Gs is used in “Gloria” by Van Morrison. Even though you’re fretting and playing only strings 1 through 3, you can still track the root E on the 6th string with your eye. C is the Bf/F used in the opening to “Johnny B. Goode” by Chuck Berry. D uses a unique spacing of the root and third and is featured in the song “Tripping Billies” by Dave Matthews Band. This interval is often called a 10th because the 3rd is a register above the root, ten steps in the major scale. E is an inverted 3rd with the root in the top position and the 3rd in the bass. It’s used as a B/Ds and an A/Cs in the opening to “Hold On Loosely” by 38 Special. F is a G/B with some unique spacing that’s arpeggiated in the opening to “Cliffs of Dover” by Eric Johnson. “Soul Man” by Sam & Dave.